A third-party evaluation was implemented from January through July 2017 to assess the results of the Nuclear Security Project at the Kharkiv Institute of Physics and Technologies in Ukraine (*completed in December 2014 with 173 million JPY disbursed). 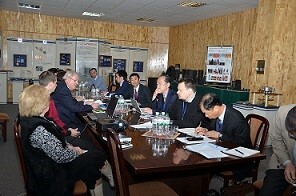 In April, three experts of “p2 company co., ltd”, entrusted with the task of evaluation, visited the Kharkiv Institute as well as discussed the results of the project with the representatives of the Ministry of Foreign Affairs of Ukraine, State Nuclear Inspectorate, Science and Technology Center in Ukraine and Kyiv Institute for Nuclear Research. The evaluator assessed the project in terms of operational conditions of the mass-spectrometry system and perimeter protection system provided under the project, coordination and synergy with other Donors’ activities, and maintenance plan and conditions. The findings of the evaluator were compiled into a report and presented to the Japan-Ukraine Committee with recommendations and lessons learnt for the future activities.